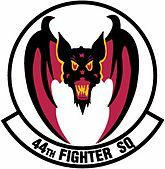 The 44th Fighter Squadron is part of the 18th Wing at Kadena Air Base in Okinawa, Japan. The 44th Pursuit Squadron was activated on 1 January 1941 and assigned to the 18th Pursuit Group. The 44 FS operates the F-15 Eagle aircraft conducting air superiority missions. The 44th Flew patrols over the Pacific from Hawaii from 7 December 1941–October 1942. It went on to fly combat missions in the South and Southwest Pacific from 21 December 1942 – 15 August 1945. It again flew combat missions in Southeast Asia from 18 December 1964 – 25 February 1965, 21 April – 22 June 1965, 19 –29 October 1965, and 25 April 1967 – 6 October 1970. The squadron was unmanned from 31 December 1966 – 24 April 1967 and November 1970–15 May 1971. It has flown air defense over Okinawa and Japan since 1971. On January 17, 2006 an F-15C of the squadron crashed into the Pacific Ocean near Okinawa. The pilot ejected and was rescued by an HH-60 of the 33d Rescue Squadron. The 44th Fighter Squadron was named as the winner of the Raytheon Trophy for 2012. Air Combat Command officials announced a stand down and reallocation of flying hours for the rest of the fiscal year 2013 due to mandatory budget cuts. The across-the board spending cuts, called sequestration, took effect 1 March when Congress failed to agree on a deficit-reduction plan. Squadrons either stood down on a rotating basis or kept combat ready or at a reduced readiness level called "basic mission capable" for part or all of the remaining months in fiscal 2013. This affected the 44th Fighter Squadron with a reduction of its flying hours, placing it into a basic mission capable status from 5 April-30 September 2013. On May 28, 2013 an F-15C of the squadron crashed into the ocean off Okinawa. The pilot ejected and was rescued by the Air Rescue Wing Naha Detachment of the Japan Air Self-Defense Force. On June 11, 2018 the pilot of another F-15C from the squadron ejected over the sea off Okinawa. This pilot was also rescued by the Air Rescue Wing Naha Detachment of the Japan Air Self-Defense Force. ^ a b c d e f g h i j Dollman, TSG Davis (16 October 2016). "Factsheet 44 Fighter Squadron (PACAF)". Air Force Historical Research Agency. Retrieved 26 December 2016. ^ a b c d "Library: History: 18th Wing History". 18th Wing Public Affairs. Archived from the original on 27 September 2015. Retrieved 26 December 2016. ^ Slavin, Eric (19 January 2006). 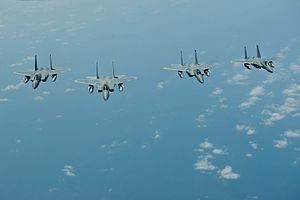 "F-15 crashes during training off Okinawa". Retrieved 15 June 2018. ^ "Governor demands F-15's stop flying after Tuesday crash". 24 January 2006. Retrieved 15 June 2018. ^ "F-15C 17 Jan 06" (PDF). usaf.aib.law.af.mil. Archived from the original (PDF) on 4 March 2016. Retrieved 16 October 2014. ^ Doyle, Brooke P. "44th FS named Air Force's top air superiority squadron". U.S. Air Force. Retrieved 14 March 2018. ^ a b c Everstein, Brian; Weisgerber, Marcus (8 April 2013). "Reduced flying hours forces grounding of 17 USAF combat air squadrons". Military Times. Retrieved 4 October 2016. ^ LaGrone, Sam (28 May 2018). "Okinawa F-15 Crashes, Pilot Safe". news.usni.org. Retrieved 15 June 2018. ^ Roth, Betty (28 May 2013). "US Air Force Pilot Survives F-15 Crash Off Okinaw". Retrieved 15 June 2018. ^ "Officials release report on F-15 accident near Kadena AB". af.mil. 22 January 2014. Retrieved 15 June 2018. ^ Tan, Michelle (11 June 2018). "Kadena Air Base F-15 crashes off Okinawa". Retrieved 11 June 2018. ^ Rogoway, Tyler (10 June 2018). "A USAF F-15C Eagle Crashed Off Okinawa, Pilot Rescued Alive After Ejection". thedrive.com. The Drive. Retrieved 11 June 2018. "Library: Fact Sheet, 18th Operations Group". 18th Wing Public Affairs. 11 September 2007. Archived from the original on 3 March 2016. Retrieved 26 December 2016. Wikimedia Commons has media related to 44th Fighter Squadron (United States Air Force). This page was last edited on 10 November 2018, at 04:46 (UTC).